Ealing Council has launched a new parking permit for blue badge holders who have been allocated disabled parking bays. It is designed to cut down on blue badge theft from cars parked overnight. Disabled parking bays are given to people who can demonstrate that they have an exceptional need. Successful applicants have a bay marked adjacent to their home. The bay is reserved specifically for anyone displaying a blue badge. Previously, those parked in a disabled parking bay had to have a blue badge on display at all times, including when the car was parked overnight. This led to fears that blue badges could be stolen from cars. The new permit allows residents to park in any disabled bay in their street, without displaying their blue badge. Instead, a special permit is fixed to the windscreen, similar to a residents parking permit. The permit can only be issued to a vehicle if it is registered in the name of the blue badge holder meaning that it has no value to any other drivers. 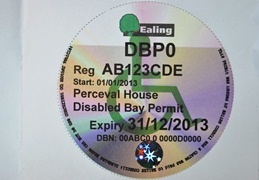 The Ealing permits are designed to be used alongside the national blue badge scheme and any blue badge holder will still be able to park in any disabled bay, even if they don’t have one of the new disabled permits. Permit holders will still need blue badges to park in disabled bays on other streets. Blue badge theft is a growing problem with 162 reported as stolen in Ealing in the last 12 months. Stolen badges are used fraudulently or sold on the black market. Councillor Bassam Mahfouz, cabinet member for environment and customer services, said: “Blue badge theft is a real problem and I’m pleased that we have been able to act on the concerns of residents and introduce these new permits. Permits are only available to residents who have already been allocated a disabled parking bay and cost £30 a year. To apply, or find out more, go to Ealing Council’s disabled parking pages.